Last December, I was on the steps of the Newfoundland and Labrador Supreme Court in St. John’s, NL, anxiously awaiting the arrival of the Judge and other parties in our case to protect the Gulf of St. Lawrence from oil drilling. At issue: the Canada-Newfoundland and Labrador Offshore Petroleum Board, backed up by the oil company wanting to drill, Corridor Resources, was questioning our right to make the case at all - our ability to have “standing” recognized by the court. Well, we’ve received news that the court has recognized us as public interest applicants – so we will be able to make our case! Last December, our excellent lawyers from Ecojustice argued – it turns out successfully – that we could make our case as we represent groups with a “public interest” in the Board issuing a new licence to Corridor Resources. Madam Justice Chaytor agreed, stating in her decision that this was “clearly a judiciable issue” with the weight needed to require the attention of our courts. Given the increase in power the federal government wants to provide for the offshore boards for Nova Scotia and Newfoundland and Labrador, and provincial plans to massively expand offshore oil and gas industry in Canada’s East Coast, I read the judge’s words regarding the constitutional significance of the role of offshore boards with great interest. Judge Chaytor’s decision stresses that what the Boards can and cannot do is very much a “serious issue” that is within the public interest to question. Because our elected leaders have delegated such powers to these boards - which are largely made up of oil industry insiders - it is very important they play within bounds. Their decisions, states Judge Chaytor “have broad ramifications and impact on the citizens of this province, and potentially beyond.” When it comes to protecting endangered species like the blue whale and the right whale: I would argue their actions could have global consequences. With this judgment, the courts have concurred that we have a “substantial and genuine interest” in the Board’s decision to grant another licence for oil drilling in the Gulf of St. Lawrence. Given our grave concerns about the survival of right and blue whales in the Gulf, and our concerns for the overall health of this magnificent but imperiled ecosystem, I could not agree more. Personally, I can’t wait to finally get our arguments against issuing this licence to drill heard by a judge. For, if we are successful (and I pray we will be) we will be able to put an end to this madness and focus on protecting and restoring the Gulf and its imperiled whales and other species. Thank you so much for taking a stand for the whales, and for making sure we could make our voices heard, loud and clear. P.S. : We are now ramping up the next phase of this make-or-break court challenge. I need to call our legal team and tell them we're ready to go and that you are standing behind us with the funds. Your gift will allow me to take this action. 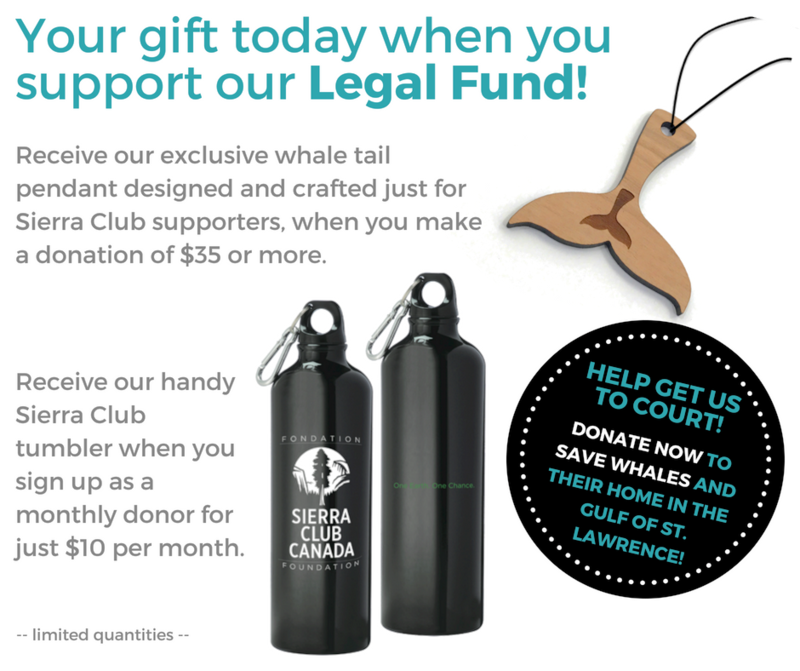 Please make a donation to our Legal Fund to save the Gulf of St. Lawrence and help us protect our most fragile and endangered whales and their calves. I'll be sure to send you our exclusive whale tail pendant for any gift you make of $35 or more. You can also support our legal fund with a small gift of $10 a month, which adds up to a BIG donation over the year. We'd like you to have our handy Sierra Club water bottle as a small token of our appreciation. Help us go all the way with this one. Thank you for standing with these beautiful creatures and the special place they call home.